Jena'tes, a place of complete an utter darkness. The planet has had so many rituals done that his literally has cracked the atmosphere and cause nearly forever cloud coverage with rain and thunder and lightning. The cloud cover always blocking out the sun, plant life on the planet has adapted to growing in darkness. Wild life scattered through all regions of the planet, swamps, jungles, ocean, wet desert, tundra. Various Sith cities around the planet, the biggest being Akvase City, Jen'ari Empire capital city, home to the Grand Jen'ari Empire Citadel. But Akvase city wasn't just home to the Sith and Imperials and Empire citizens. In the center of Akvase City stood the Sith Imperial Citadel, designed identical to Vitiate's citadel from the old republic. The Citadel reached high into the dark stormy sky. High up in the citadel was a chamber that very few actually ever got to see, the private chambers of The Dark Council. The room was massive, 12 throne style chairs sat across from each other. 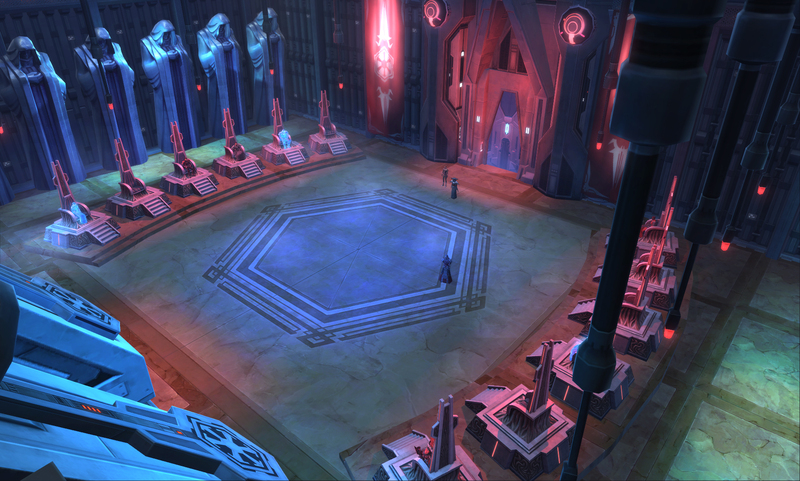 The room decorated with The Reconstituted Sith Empire/The Jen'ari Empire banners, and a handful of Sith statues. The room illuminated with a purple and blue light glow. In the seats sat Darth Animus Darth Necrin Darth Aegis Arlen Rossi Darth Adara all getting ready for the meeting to start. In the center of the room was a small flat disk. The disk then turned on with a blue light into a hologram of The Emperor, Vyrassu. Vyrassu had his Hood up over his head, his red skin and face tentacles partly hidden by the shadow of his Hood, his outfit was his traditional outfit all black robes with chest armor and his shoulder pauldrons. I have called this meeting to order for two topics that need to be addressed. The first, for the Past 10 years I've been training a Sith to Darth Level. Darth Pyktis is his name, he is a clone of my DNA, I created him. I do not wish to force him onto the Council, that power lies within all of you. But he indeed is powerful, he will be arriving to these chambers shortly. The other topic is, I Bring before you, Riamah she is the leader of a small group of power known as The Dark Hand. They are against Darth Carnifex's Empire. The reason I brought her here is due to the fact that I forsaw an attack on us from Carnifex. During a meditation period, it is certain, he will attack us, and The Dark Hand could be a valuable ally to aid us in defence. As well I've contacted mercenary companies to aid us. Riamah is here, after you discuss the alliance with her, she is permitted into the Throne room upstairs to meet with me personally. Vyrassu's hologram looks to the door awaiting Riamah to enter. The leader of The Dark Hand was a merchant at heart and a very simple woman when it came to ceremony. She understood the reason and purpose behind them and would follow the rules, but if it was up to her a meeting would be done one on one. However, this Empire was based on one from the past that was heavy into tradition and she would follow their rules. Not wanting to over dress (in a formal) or be under dressed, Ra wore what she would have worn for a business meeting. Comfortable pants and boots. She wore no robe or cloak, but a jacket over a form fitting shirt. This being the heart of a sith government, she openly wore her lightsaber at her side. There were also two boot knives and two short saber hilts up the sleeves of her jacket. Unless she was made to relinquish them, she would wear them on her body. Being requested to wait outside of the Council room until invited in, Ra stood patiently. Her arms were across her chest and she was wearing a neutral facade. Not one to openly show emotion, her eyes crossed the area around her, taking in the details. When the door opened, she walked in and remained silent until one of Council members addressed her. She showed proper respect to these people and gave a nod to each of them as she looked over the room. Darth Adara was seated on her throne, her back straight and mind alert as the emperor addressed the council. she wore traditional black sith robes and hood which slightly concealed her red skin and short facial tentacles. Her two lightsabers sitting on her lap and her senses always reaching to see what her eyes could not. She nodded to the hologram of Darth Vyrassu respectfully and turned her sharp fiery eyes to examine the newcomer, taking in every detail from the way she walked to the way she dressed to the way she did her hair. by taking slight miniscule hints from her body language, she could tell that she had some weapons literally up her sleeve but did not consider this out of the ordinary. The way she dressed told her Riamah wasn't much for tradition but preferred to show respect that came from her own code. for Adara personal respect was a greater honor than traditions and ceremonies that simply claimed respect. Darth Adara knew her father wouldn't bring this girl before the council unless he knew it would be of great value to the empire, so she strove to see in this "Dark Hand" what the emperor did, so that his wishes can be met for the glory of the empire. Adara remained silent for now, simply watching and reading this girl for anything that may give away what her words may try to conceal. Darth Necrin sat leant back on his throne, with his legs unceremonially crossed. He was wearing dark robes over a darkgrey shirt with some armor-plates on it, and black pants, with his lightsaber hanging from his belt. He had no Hood on, and neither any gloves. He sat like this, listening to the hologram of their emperor telling them why the dark Council were having a Meeting. Vyrassu had confirmed what many had suspected; an impending attack from Darth Carnifex and his empire. It came as no surprise. The leader of The Dark hand came into the Chamber. Necrin looked at her, and knew at once that he wouldn't like her. Firstly, she was human. An inferior race to the chiss, and populating too much of the Galaxy. Secondly, the way she dressed. She was Meeting with the Dark Council, and was wearing what looked like common clothing. Necrin was a man of tradition and respect, and thought that she could at least have dressed a little more formal. When this Riamah looked at the Dark Councilers, she gave a nod to everyone. At least she showed some respect. But it didn't save the impression Necrin already had of her. No matter what Necrin thought of her, the group she was leader of was also an enemy of Carnifex. A common enemy could make Necrin look past what he thought of her, and listen to what she had to say. He fixed his eyes back on her, leant forward, resting his arms on his crossed legs and his head on his arms, and was ready to listen. It would have to be discussed. Animus turned his head then as Riamah entered the chamber. He had heard whispers of her through his contacts, though to finally see her in person dispelled many of his initial thoughts. When she eventually bowed to Animus, he did not return the gesture, instead simply taking the time to watch, and listen. Aegis watched as Riamah entered the chamber. He sat silently in his seat, simply observing the other council members throughout the speech. His trait of observation was what made him a strategist, in his eyes. Aegis was intrigued at the idea of cloning, especially ones self. Vyrassu looked to Riamah and nodded her direction. This is Riamah, she has agreed herself to be aligned with us, you all are free to ask her questions as you see fit. Vyrassu remained silent for the meeting to continue. Edited by Darth Vyrassu, 16 January 2019 - 09:32 PM. Adara Again looked atDarth Vyrassu , then back at @Riamah. She could sense that the Emperor had already been in contact with the girl standing before the counsel. She must have contacted him directly and spoken with him about her initiation into the Jen'Ari Empire. Because she had never heard of this girl, or the "Dark Hand". In any case, the Emperor himself must already approve of Riamah, having already given her permission to stand before him to speak privately in his throne room when the counsel is finished questioning her, not even considering that the counsel may not approve of her from their investigations. But for Adara, the will of the Emperor is her greatest desire. And pleasing him is her single drive. And if allowing this unknown character to join the Empire will please her Emperor, then she will not question it. However, her fellow counsel members may see things differently. Her line of questioning should be in such a way as to put the girl in a shinning image for the counsel, but what to ask? Darth Adara leans forward in her seat slightly to speak. "Riamah. you come before the counsel to receive our judgement as to whether you are worthy to join the Jen'Ari Empire. The way of the sith is violent and brutal, but also demands loyalty to the Emperor. While I could ask you to swear your fidelity to the Emperor here before the counsel and the Emperor himself, I believe words are a double edged sword. Instead I ask of you... how can you SHOW your loyalty to our Emperor, and to the Empire?" Edited by Darth Adara, 18 January 2019 - 01:41 AM. Standing strong under the gazes of the Council, Ra did not say anything until she was spoken to. Her eyes flicked to the image of Vyrassu when he spoke and nodded only slightly when he said they were free to ask her any questions they might have. Turning to face Adara as she spoke and asked how Ra could show she would be loyal to them and the Emperor, she smiled just slightly. It was not a friendly smile, but one filled with confidence and maybe even a bit of ego. If there was one thing that could be said about Ra was that she was confident. "By my actions. I can not show you my loyalty right here and now, my Lord. In time, it will be clear though." Knowing of the upcoming Sith Empire attack played a key role here. She and some of her people would be present on Csilla. That was all there was to it. The future would prove the question and not the now.